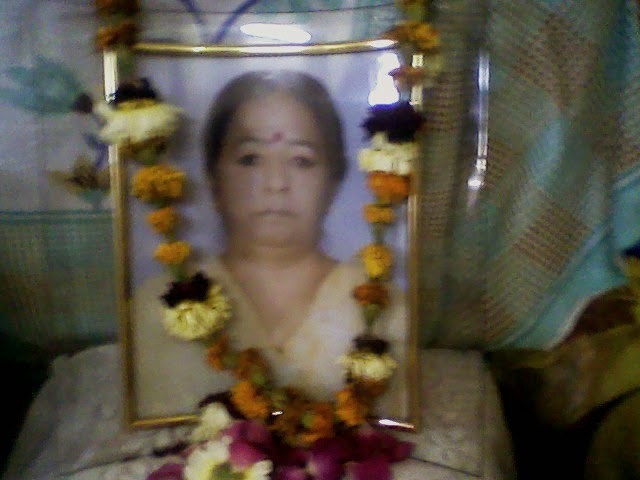 This year I lost my mom Mrs. Raj Khattri on 16th of March. She was everything for me : my friend, philosopher and guide. This mother's day Maa I am alone, unable to wish you and talk to you, but Maa your sweet memories, your inner strength, your sacrifices, your teachings will always remain with me throughout my life. This Mother's day I am recalling each and every minute I spent with you from my childhood till date. Thank you Maa for each and every thing you have done for me. Bathua is known as Chenopodium in English, it is a healthy green leafy vegetable rich in vitamin A, magnesium, potassium and Iron. Bathua is used in recipes in many ways , like saag with potatoes, bathua paratha, and bathua raita. As bathua is an unusual green, its cleaning require much time than other greens hence people don’t prefer to eat this, but as far as its health benefits are concerned one should try to include bathua in diet. For me it is very easy to include it in form of poori. Clean and wash bathua leaves. boil bathua leaves, green chillies with 1 tablespoon water till 3 whistles. with the help of hand blender, puree it or grind it to fine paste. In a bowl add bathua puree, salt, cumin powder and garam masala powder, mix well and knead it to stiff dough, add water if required. heat sufficient oil in kadhai, take a small ball of dough, roll out poori with it and deep fry poori in hot oil. Prepare all the pooris in the same way. 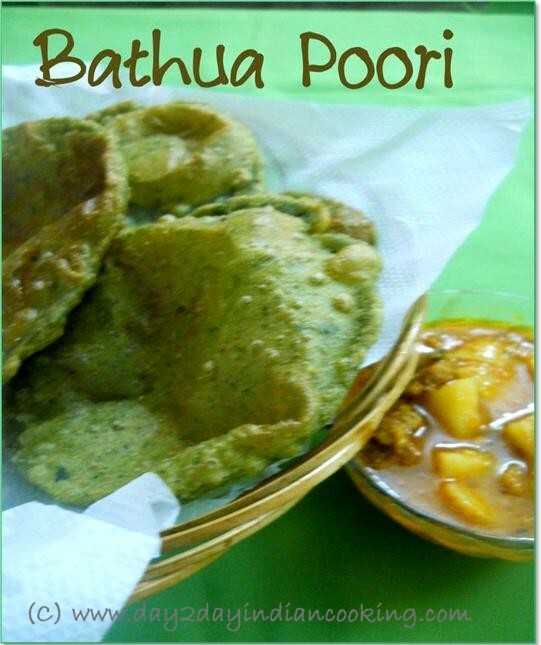 You can serve bathua poori with any gravy dish or with spicy potatoes. If preparing for breakfast, prepare puree a day before and than make pooris with it, or you can make puree once and use it differnt recipes. Want to know more about chenopodium health benefits refer to this news. 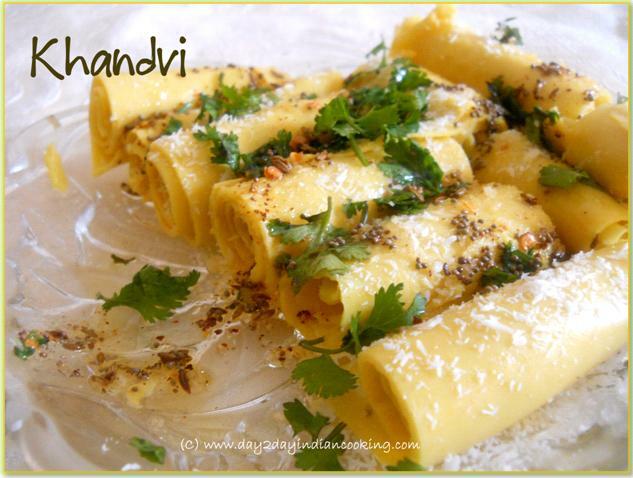 Khandvi is a Gujrati snack recipe, seems difficult but very easy to prepare. During my last visit to Ahmedabad, I had a chance to taste khandvi with mild and sweet chutney, from then it was in my to-do-list and finally I am posting khandvi recipe on my blog. Heat a non stick pan, pour batter in it, stirring continuously cook on high flame, as it starts boiling set the flame to low , stir it till batter thickens(refer to pick). Take a teaspoon of mixture spread it on greased thali or tray, spread it with the help of spatula, check if it is rolled easily, then mixture is ready, if not means mixture is not ready and require more cooking. Spread mixture on tray, let it cool completely. With the help of knife divide it in lenghtwise strips, with the help of fingers gently lift upwards and then make rolls with each part and arrange all rolls in a plate. Heat oil in a tadka pan, add mustard seeds and cumin seeds as they crackle add red chilli powder and pour this tadka over khandvis. Sprinkle some coriander leaves and coconut as garnishing. Serve with chutney of your choice. When batter starts boiling, reduce the flame to low and stir continuously till it thickens. Mixture will spread easily only when it is warm , so you have to work fast. Looking for other easy Indian snacks, please check my earlier post 10 indian deep fried snacks. If you like this recipe please share it on facebook, twitter, g+ and Pinterest using the share buttons on top. Coriander is a healthy ingredient with lots of maganese, folic acid, vitamin C and vitamin K. Coriander leaves help to reduce bad cholesterol(LDL). We generally use it as garnish, in order to increase its intake in our diet, one easy method is to make chaat from it. 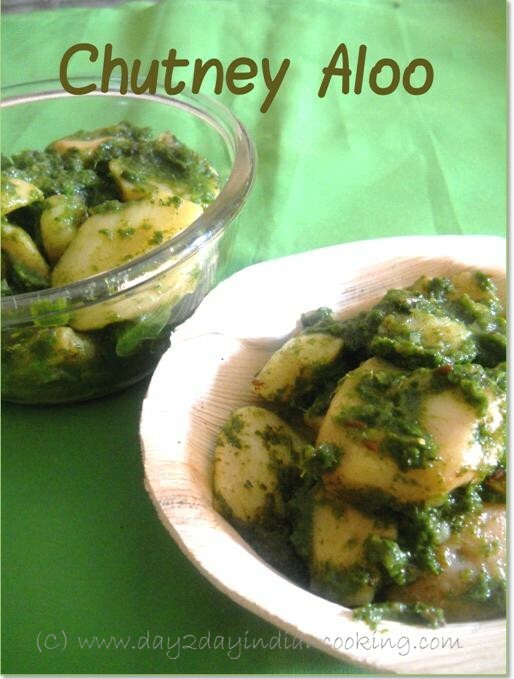 Chutney aloo or Dhania aloo is a famous North Indian Chaat recipe with lots of fresh coriander(dhania) leaves in it. You can also serve this recipe as an appetizer. In this recipe first chutney is prepared and then combined with boiled potatoes and other spices, if you have already both things in fridge you can prepare it within 5 minutes. grind coriander leaves alongwith ginger and green chillies. add chaat masala powder, salt, chutney and lemon juice to it, mix well, cook for 1-2 minutes by gently turning it. In this recipe I have used red potatoes(lal aloo) as their starch is of good quality, they are firm in texture. You can also make this recipe with baby potatoes. Mint flavored aloo bhujia can be used as a garnish, gives a nice crunch and flavor to this recipe. Searching for similiar recipe please try pudiney waley aloo. Amla or Gooseberry is rich in Vitamin C and other nutrients. Homemade Jam is a method of preserving any fruit for further use. I always prefer Homemade Jams to packed one as they are free from artificial color and preservatives. Today I am sharing with you my recipe of Homemade Gooseberry Jam made with only 3 ingredients. Adjust the flame to medium to low, stirring continuously cook till mixture starts drying up and gooseberries start turning to transparent, this will take approx 12 minutes(during this process instead of stirring continuously you can stir after every 2 minutes but keep eye on it. last 5 minutes of cooking are very important, set the flame to low, take a plate test ( refer to my earlier post of mango jam) if jam passes the test means it is ready else require more cooking time approx 2 minutes. Homemade gooseberry Jam is ready. Amla has lot of pectin in it hence no need to add pectin. If not using Microwave, you have to boil gooseberries till soft and then grind them to puree, along with boiled water many nutrients drain, you can use that water for kneading chapatti dough or use it in dal. Cooking time will increase this will take approx 40-45 minutes. Don’t overcook Jam and don’t cook on high flame else it will become hard and sticky and it will be difficult to spread it. Difference that I have noticed in both cooking methods(boiling or microwaving) is that after microwaving gooseberries remain sour and sufficient amount of sugar is required else Jam tastes sour. 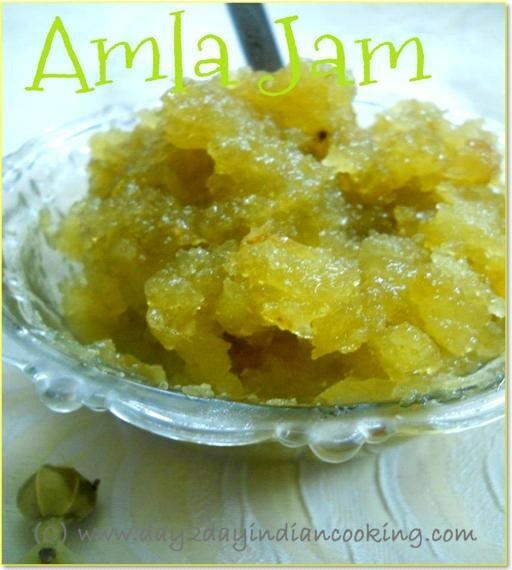 If looking for another recipe made from gooseberry, you can also try amla chutney recipe. If you want to know what more you can do with your microwave please check these microwave oven cooking tips. All the content of this website is copyright (C) www.day2dayindiancooking.com. Powered by Blogger.